After almost 20 years of playing with myself, I’ve joined a band. I’ve been twice married, lived in three different states, and had a son since the last time I played music with other people. It’s been a long road to get here, but it feels fantastic (even if a bit terrifying). The band in question is “Phil Rossi and the Awakening”, led by author and hoopy frood Phil Rossi. We’ve got a live show at Balticon (in … five days! _gulp_) in which time I need to finish learning 13 songs with one full band rehearsal on Wednesday. I started playing music when I was a kid. I don’t remember the age (probably 8 or 9) but we always had a piano in the house while growing up and I would sit at that piano and perform grand concerts. In my head they were grand, to anybody listening it was probably a cacophony of notes, hand slaps, and howls. My brother was an amazing guitarist and his strumming, singing, and full band rehearsals were a constant in my life. 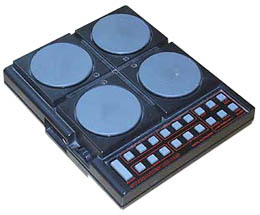 When I got a little bit older my mom bought me a SynSonics drum pad and I spent countless hours hammering out drum beats. For a short time I played trombone at school before buying a bass guitar. I initially chose bass because everybody wanted to be a guitarist, or a singer, or a drummer. Why jump into something that’s going to be saturated with other people? This has actually served me well since you can usually swing a cat and hit a guitarist, but good bass players are harder to come by. I came to realize later that I had a deeper connection to playing bass though. I’ve always been drawn to rhythm and percussion and bass is intimately tied to these. In high school I started jamming with friends. I also played around with my friends guitars, figuring out Metallica, Helloween, and Iron Maiden riffs. I had a decent knack for playing songs by ear. A friend of a friend came by my place to hear me play a little bass on a combo amp I had in my garage. He liked what he heard and invited me to try out for the band at his place. In a classic scenario, I showed up and plugged into the current bass players rig (who wasn’t there at the time) and we played a couple tunes. They asked if I wanted to join the band and called him to come and get his stuff! We played together for several years and enjoyed a decent amount of success. Through circumstances I won’t go into now, we missed out on a possible recording deal and shortly thereafter the band broke up. Well, a member of the band left anyway and the rest of us wanted to start something new, rather than continue on with the old name. We played together in side projects and substituted in friends bands when they had members out sick or whatever but didn’t make any significant progress. Not to say we didn’t have a great time and write some awesome songs! But we grew up.. and I ended up getting married and moving out of state. That was the last time I played with anybody. And since bass is pretty damn boring to play alone, I largely abandoned it. I continued to fiddle with music off and on, playing electric guitar, programing drum loops and virtual synth instruments, but it was always a back-burnered activity, falling behind other pursuits. Lately I’ve been embracing the creative – largely due to urging and inspiration from my wife – I’ve been writing fiction, I’ve been writing music, and I’ve been reaching out to other artists. The opportunity came to play with Phil and though it seemed like things would never line up, I made it over for a jam session and it was exhilarating. I felt like I could barely string two notes together for a bit as I was clearing out the cobwebs, but Phil and his drummer Keith were very encouraging and complimentary and it was a blast. That’s my story.. no morals, no big take away.. Just, I’ll never forget the strength of a loving partner, and will cherish the communion of a rock groove with a group of like minded explorers. I can’t wait to get to the next practice! As an early Halloween treat, I’m pleased to bring you The Zombie Connection.